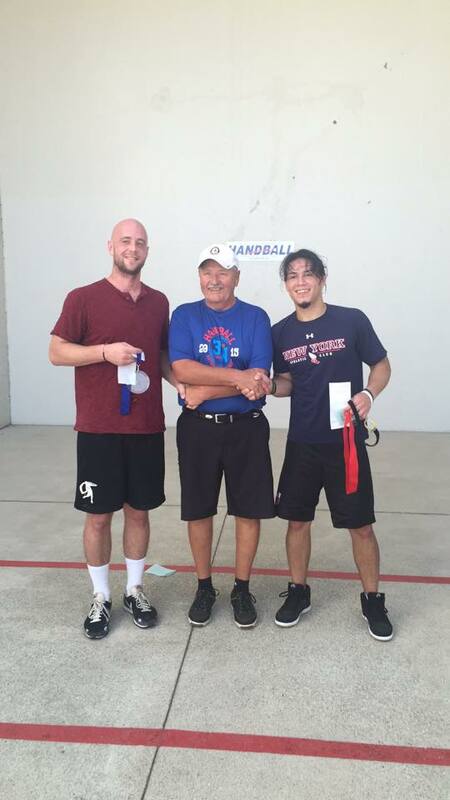 Scorching heat and humidity greeted the best 3-Wall handball players in the world at the 2015 USHA National Three-Wall Championships in Maumee, Ohio, as players faced temperatures in the upper 80’s with on-court temperatures approaching 100 degrees. Fitness would be as important as 3-Wall strategy and execution for players targeting elusive championships in Maumee. Sean Lenning entered the USHA Three Wall Nationals as the six-time defending champion, winning his first 3-Wall national title at 19 in 2004 and collecting five more championships between 2005-2014. Awaiting Lenning in the final for the second consecutive year was Tyree Bastidas, one of the game’s most exciting and decorated outdoor stars and winner of the 2013 USHA Three-Wall Championship. The current 3-Wall National Champion, WPH R48 Player’s Champion and 1-Wall World Champion met the current 1-Wall National Champion and former 3-Wall National Champion for the third time in the 3-Wall National Final since 2012, with Lenning winning the previous two encounters. Bastidas started well in the pair’s third 3-Wall final clash, matching Lenning shot-for-shot en route to an 8-6 first game lead. Bastidas pushed Lenning to an 11-7 tiebreaker loss in 2012 and the pair appeared to be headed towards a similar type of thriller. Lenning tied the score at nine and completely dominated the second half of the game one, scoring 12 of the final 13 points to take a one-game lead, 21-10. “Sean was serving and shooting and just not allowing Tyree to get into the rallies,” stated Lenning’s 3-Wall doubles partner and #teamR48 reporter Marcos Chavez. Lenning continued to cruise, scoring points at will against an exhausted and completely overwhelmed Bastidas. Bastidas needed to take a timeout at 13-0 to throw up in a trashcan. Unfazed, Lenning maintained the pressure by executing deep pass shots, fly kills and service winners. Lenning ended the match by scoring 33 of the final 34 points in the match, including all 21 in game two. Lenning’s incredible 2015 season continued, as he added his 7th USHA Three-Wall Singles Championship to his 2015 WPH R48 Player’s Championship, 2015 WPH Outdoor Xrossover Championship and 2015 1-Wall Small Ball World Title. Thank you to #TeamR48 reporters Matthew Chu and Marcos Chavez for the updates and pictures. To follow all of the divisions and scores from the 2015 USHA National Three-Wall Championships, click here. For all of the news from the world of handball, go to wphlive.tv.